WASHINGTON (CNN) -- Sen. John Kerry said Tuesday he will offer a new explanation and clarification of a $7.5-billion Pakistan aid bill that has prompted a firestorm of anti-American sentiment inside Pakistan. 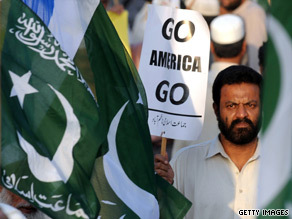 Opponents say the United States is meddling in Pakistani affairs. Kerry, D-Massachusetts and chairman of the Senate Foreign Relations Committee, stood beside Pakistani Foreign Minister Shah Mahmood Qureshi at the U.S. Capitol on Tuesday afternoon to announce that he and other congressional leaders would release what Kerry called "report language with the force of law" to clear up questions about the nonmilitary aid bill. The explanation would accompany the bill, which was passed unanimously by the House and Senate, when it is formally sent to President Obama to sign into law, something that could happen in coming days. "If there are misrepresentations, we're going to clarify this," Kerry told reporters after he and Qureshi met in private. The United States says the aid bill makes no new demands on Pakistan, but some Pakistani politicians say it will result in American micromanagement of Pakistan civil and military affairs. Kerry said the multibillion-dollar aid package would provide "deeper, broader, long-term engagement with the people of Pakistan." He said the aid is a sign of friendship and was never intended to interfere with Pakistan's government. Kerry and the Pakistani foreign minister are set to meet again Wednesday. The statement of clarification will probably be submitted jointly by Kerry; Indiana Sen. Richard Lugar, the ranking Republican on the Foreign Relations Committee; and Rep. Howard Berman, D-California and the chairman of the House Foreign Affairs Committee.